The Revised Code of Washington (RCW) is a compilation of all permanent laws in force. It is a collection of session laws arranged by topic, with amendments added and repealed laws removed. It does not include temporary laws such as appropriations acts. The official version of the RCW is published by the Statute Law Committee and the Code Reviser. Annotated versions are published by commercial vendors. 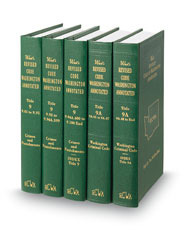 The current RCW consists of ten volumes. Volume 1 includes the U.S. Constitution, the Organic Act, the Enabling Act and the Washington State Constitution as well as Codification Tables, a Table of Initiatives and Referenda and the Table of Disposition of Former RCW Sections. Volume 10 is a General Index. A new edition of the entire set is re-issued in even-numbered years with supplements issued in the odd-numbered years. The Revised Code of Washington was adopted by the legislature in 1950 (see chapter 1.04 RCW). The original publication (1951) contained material variances from the language and organization of the session laws from which it was derived, including a variety of divisions and combinations of the session law sections. During 1953 through 1959, the Statute Law Committee, in exercise of the powers in chapter 1.08 RCW, completed a comprehensive study of these variances and, by means of a series of administrative orders or reenactment bills, restored each title of the code to reflect its session law source, but retaining the general codification scheme originally adopted. An audit trail of this activity has been preserved in the concluding segments of the source note of each section of the code so affected. The legislative source of each section is enclosed in brackets [ ] at the end of the section. Reference to session laws is abbreviated; thus "1891 c 23 § 1; 1854 p 99 §135" refers to section 1, chapter 23, Laws of 1891 and section 135, page 99, Laws of 1854. "Prior" indicates a break in the statutory chain, usually a repeal and reenactment. "RSS or Rem. Supp. --" indicates the parallel citation in Remington's Revised Code, last published in 1949. Note: taken from Volume 1, p. iv, of the 2012 ed. Each section of the RCW is made up of three parts: number of title; number of chapter within the title; and number of section within the chapter. For example, RCW 1.04.020 refers to Title 1, chapter 4, section 20. Official: The print version of the RCW that contains the certificate of the Statute Law Committee is considered the official code (see RCW 1.08.040). Revised Code of Washington, 1974-. Located in the Kelley Reading Room. Revised Code of Washington, 1951-1973. Located on the third floor. Commercial: West's Revised Code of Washington Annotated (commonly called RCWA) is a convenient set of Washington laws with annotations following each section. In addition to case annotations, references are provided to law review articles, pertinent Key Numbers in the American Digest System, legal encyclopedias such as Corpus Juris Secundum (CJS), and treatises including the Washington Practice series. Print: The current RCWA is located in the Kelley Reading Room. Superseded volumes are kept on the third floor.